WHEN a federal Coalition MP says a group of public employees deserve to have their wages more than doubled to $150,000, listeners are bound to wonder if their hearing is faulty. Australia’s conservative parties have a history of opposing big pay rises for employees. But a few weeks ago Tony Smith stepped away from that orthodoxy in a speech to the the Sydney Institute. Invited to speak about improving national productivity, Mr Smith, MP for the Melbourne seat of Casey, chose schooling as his topic and the importance of making teaching a prestigious profession in order to lift teacher quality and student achievement. 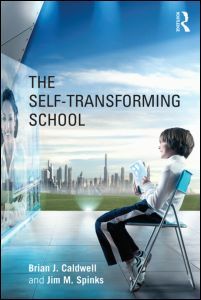 To do that, he said, Australia had to attract more of its intellectual elite into schools by introducing a performance-based career structure and paying teachers the salaries of doctors and lawyers. “We need to pay truly excellent teachers truly excellent wages,” Mr Smith, a former opposition education spokesman, told the audience. “Even up to $150,000 for those exceptional educators who, not only teach their students, but who teach and mentor their colleagues as well. His concern that relatively low pay stops most of Australia’s best students from considering teaching as a career is shared not only by teacher unions but by many education policy specialists. Just how toxic teaching is among high achievers is revealed in new figures on university offers to year 12 students released earlier this month by the federal Higher Education Department. Education was the least popular course for school leavers with the highest university entrance scores, with only 5 per cent of offers made to students with an Australian Tertiary Admissions Rank (ATAR) above 90.05. 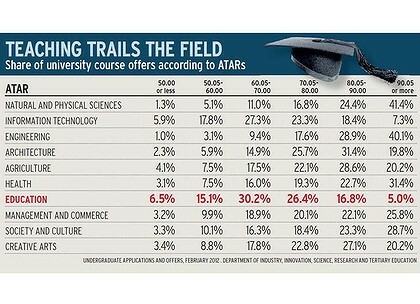 Almost 22 per cent of offers in education courses were made to students with ATARs below 60, including almost 7 per cent of offers to students who scored below 50. Teacher education specialists say the large number of low achievers entering teaching courses is a trend that has been worsening over the past 20 years. Dr Lawrence Ingvarson, one of Australia’s leading teacher education specialists, says the latest figures are deeply worrying and risk sabotaging the Gillard government’s multibillion-dollar school improvement reforms, including its measures to lift student literacy and numeracy and teacher quality. “The inconsistency of this just shouts out at you,” says Dr Ingvarson, a principal research fellow at the Australian Council for Educational Research. “We’re recruiting people into teaching who are not as academically able as they need to be and who are going be costly in the future. “In Australia out of every 100 people who enter teacher education programs about 50 or more drop out. It means there’s enormous wastage going through the system. Within schools there is unease among teachers about the calibre of many recent entrants to the profession. School teachers with more than 20 years’ experience assessing year 12 English exams and supervising student teachers in secondary schools, told The Age that university students with ATAR scores below 60 were likely to have very limited skills in written English, comprehension and analysis. “There are fewer and fewer people coming into the profession who can proofread [student work] accurately,” says a year 12 English exam assessor who did not want to be identified. “They can’t recognise the errors because their own writing is littered with grammatical errors of syntax and of verb tense. This has been a problem for longer than the latest ATAR figures indicate. 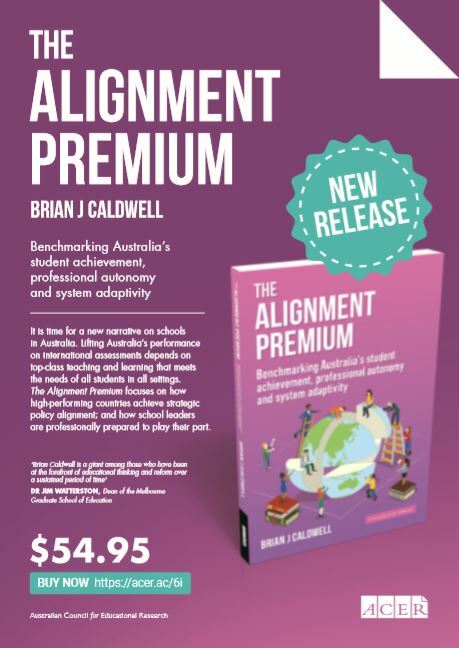 Professor Brian Caldwell, who runs professional development seminars and research projects with teachers nationwide, is also aware of simmering discontent within the profession about large numbers of low achievers entering education courses. Currently people wanting to become school teachers enter education courses at university via an undergraduate degree or at a postgraduate level. Professor Caldwell says moving all courses to graduate-level entry would be one of the most effective policy levers available to the federal government, given its promise last year to raise the standard of entrants to teacher training. 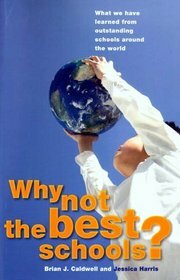 Countries with the most rigorous entry requirements for teacher education courses, such as Finland, Taiwan and Singapore, also had the highest achieving school students in international testing schemes. “We’ve had in excess of 30 reviews into teacher education over several decades and no government has taken on most of the recommendations,” says Professor Caldwell, an educational research professorial fellow at Melbourne University, whose recent review of teacher education courses for the Queensland government had similar findings about the standard of entrants unearthed by previous inquiries. Last year, the federal government announced its new national accreditation system for education courses would require entrants to have literacy and numeracy skills broadly equivalent to the top 30 per cent of the population. Universities that recruit students below that level must show they have remedial programs to bring them up to the required standard. In an effort to clarify how to measure the top 30 per cent and make it easy for universities to implement the new requirement, the agency that sets the accreditation standards, the Australian Institute for Teaching and School Leadership, has commissioned a report to recommend the best way forward. Earlier this month, the Productivity Commission released its report on Australia’s school workforce and endorsed the 30 per cent requirement as one way to improve the quality of future teachers. But it warned that the new system must be evaluated to test its effectiveness and was likely to have limited impact if large numbers of bright students continued to avoid applying for education courses. Instead, the report found that a relatively low salary, for what has become an extremely complex and demanding job, lies at the heart of why teaching remains unattractive to most high achievers. Surveys of people who do not choose teaching as a career revealed the profession’s pay and working conditions were important factors in their decision. The flat pay scale, where incremental wage rises are mainly tied to length of service and teachers reach the top of the pay scale within 10 years, is also one of the reasons why many highly effective teachers leave their jobs mid-career to find better paid work elsewhere, the report found. About 95 organisations and individuals made submissions to the report, which was commissioned by the federal government to advise it about the supply of teachers, factors affecting workforce skills and how to increase the efficiency and effectiveness of the school workforce. 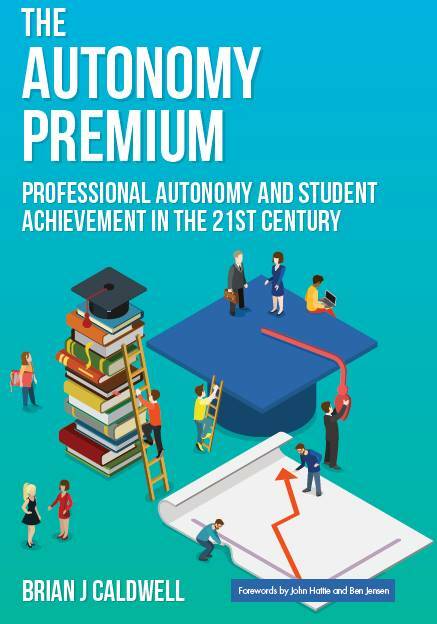 The report urges education authorities, governments and unions to improve teacher quality and the status of the profession by taking a more innovative approach to industrial workplace arrangements governing pay and conditions. It recommends an overhaul of the career structure to link pay more closely with high performance, as well as giving principals the autonomy to offer higher pay rates to overcome shortages in hard-to-staff schools and in subjects such as maths and science. Teacher unions traditionally have opposed such measures, arguing that they undermine the profession’s collegiality. But the report says extra pay incentives already operate in Australia, mainly in rural and remote schools. “A similar story has unfolded in Sweden, where an initially opposed system allowing principals to provide teachers with extra pay to overcome shortages now enjoys an approval rate of over 70 per cent among unionised teachers,” the report says. It also raises doubts about continuing the traditional workforce policy focus on reducing class sizes. Large falls in average class sizes over recent decades had not led to big improvements in children’s literacy and numeracy. “The across-the-board approach to class size reductions has been a costly policy that has not translated into a commensurate improvement in overall student outcomes,” the report says. The commission estimates a new standards-based career structure linked to performance and better pay would increase annual salary costs by about 20 to 25 per cent, or $6 billion when fully implemented. Salary rises of that scale are likely to have an immediate impact on school leavers considering their career options, according to Margaret Saltau, an executive member of the Victorian Association of the Teachers of English, who has been teaching English in secondary schools since 1969. In recent years she has taught year 12 English to girls at Loreto Mandeville Hall in Toorak and more recently to students at Isik College in Eastmeadows.